Women Mesh Patchwork Sport Leggings Fitness Yoga Pant Running Tights Sportswear Sports Trousers Professional Training Leggins Features: Item: Running Tights Material :polyester spandex Nylon Style : Slim models,casual,tight,legs,sports Season : Spring summer autumn winter Type:Women / Ladies Yoga Pants Feature:Breathable Tights Yoga Pants Pants : women yoga leggings, women running tights Color : as picture Size: Chinese size (Smaller than Euro) Size: S M L XL Size Details: 1. Please strictly follow the size chart to select the size. Do not select directly according to your habits. ​ 1 * Pants Note: 1. 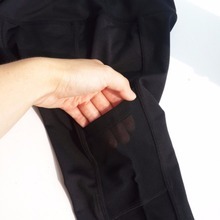 The size of these pants are Asia size, it may run smaller than US size, please have a check of the size detail before purchasing. 2. There might be chromatism between the real item and the picture because of the light and display screen and it is normal to have 1-2 inch measurement mistake.All subject to the item that you received. 3.and if you have any problems with this item please contact me first to see if any solutions can be done before leave a negative feedback. Thank you for your understanding. Please don’t apply a dispute before contact us, we 100% sure you will get your package, Or get you money back, thanks!!!! 1.Please check your shipping address and information before you make the payment. 2.For BRAZIL customers,please kindly provide your CNPJ in your shipping address,by which it will be faster for custom clearance and the parcel will be received earlier. We accept Escrow,Credit card,T/T,Western Union and other payment types. If you use ESCROW,secure payment service is automatically applied in every transaction. We will send your order within 1-3 working days,once the payment is completely verified. All shipments have tracking number, any custom fee or import tax is under buyers’responsibility. 1.Contact us within 3 days after the reception. 2.Send the item within 10 days. 3.Provide us the shipping tracking number. 1.12 months Manufacturer’s limited Warranty for defective items (excluding items damaged and/or misused after receipt).Accessories come with a 3-month warranty. If you are satisfied with our products,a positive evaluation and 5 stars in each category is greatly appreciated. All suggestions are welcome, we are working hard to improve our service and let our customers to be happy even in case of disagreements. wPlease contact us if you are not glad with our products before you leave a neutral or negative feedback,we will try to fix the.